The Paredez lab studies Giardia lamblia. Giardia is an important parasite that affects a wide variety of animal hosts, including over 100 million (mostly impoverished) people each year. Treatment options are limited; therefore, the WHO has recognized Giardiasis as a neglected disease. In addition to Giardia being a major parasite, this organism stands out as one of the most evolutionary divergent eukaryotes (from animals) that can be manipulated in the laboratory. Many evolutionary studies have placed Giardia at the base of the eukaryotic tree; therefore, Giardia is a window in which evolutionarily deep cellular mechanisms may be examined. We are particularly focused on the regulation and function of the cytoskeleton. Both eukaryotic and prokaryotic cells have a cytoskeleton which plays a central role in processes such as regulating cell shape, moving cargo, and performing cytokinesis. 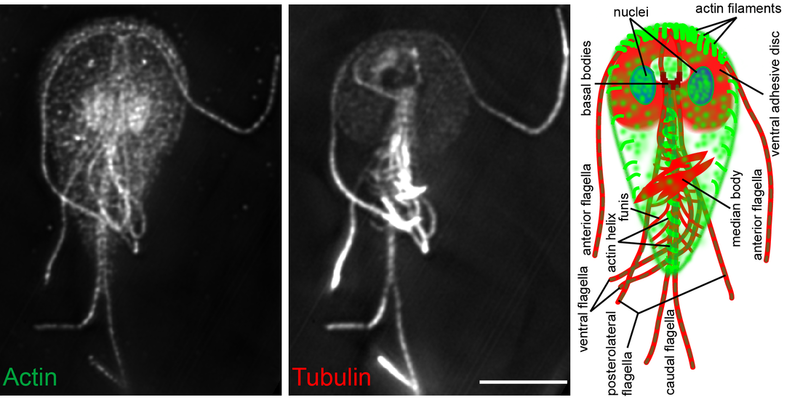 While the majority of microtubule cytoskeleton components can be identified in the Giardia genome, none of the core set of homologous actin-binding proteins (e.g. : nucleators, motors, bundling, and severing proteins), can be found in Giardia. Yet, the Giardia actin cytoskeleton still has complex organization that is dynamically regulated throughout the cell cycle. Moreover, the Giardia actin cytoskeleton has a conserved role in cellular organization, trafficking, and cytokinesis. Importantly the giardial actin cytoskeleton is both essential and highly divergent from that of humans; therefore, it represents an important potential target for treating this neglected disease and an opportunity to gain insight into evolution of the cytoskeleton. Actin and Tubulin staining in Giardia trophozoites. In other eukaryotes G-proteins such as Rac1, Rho, and CDC42 are upstream of the actin cytoskeleton. These proteins act as molecular switches that control essential cellular processes. Giardia contains a single Rho family GTPase homolog, GlRac (versus 22 G-proteins in mammalian cells), which we have demonstrated to play a conserved role in regulating polarity, membrane trafficking, and the cytoskeleton; all of which are essential to viability and pathogenesis. 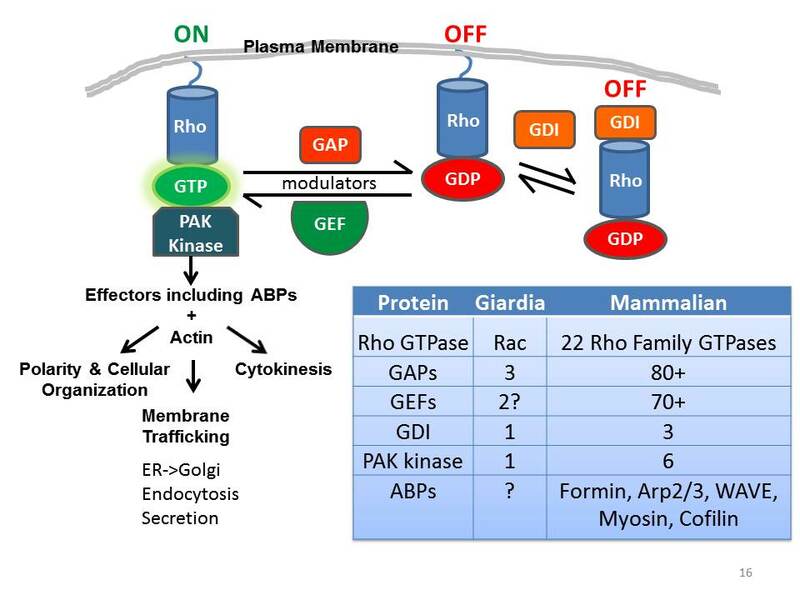 What remains unknown is how these processes are controlled, as Giardia lacks the downstream effectors that typically connect Rho GTPases to other molecular pathways. Novel (and potentially ancient) downstream effectors are hypothesized to link GlRac signaling to the cytoskeleton and membrane trafficking. We are focused on determining the manner in which polarized GlRac signaling is established, uncovering the extent to which GlRac regulates membrane trafficking, and identify the underlying connections between GlRac, cell polarity, membrane trafficking, and cytoskeletal dynamics. This work is expected to yield new molecular insights into Rho GTPase biology and lead to the discovery of novel therapeutic targets; furthermore, because Giardia is a deep branching eukaryote, it may also uncover ancestral mechanisms of cell signaling and further establish Giardia as an exemplar of eukaryotic minimalism. Giardia lamblia is a member of the supergroup Excavata, purportedly the most ancient of eukaryotic lineages. Giardia is also a minimalist with simplified cellular pathways, which are often composed of fewer components than other eukaryotes. Of particular interest is that Giardia lacks all canonical actin binding proteins including myosin motors that are typically used for cell division. We aim to elucidate the mechanism of myosin independent cytokinesis in Giardia. Importantly, the mechanism used by Giardia is likely to underlie the mechanism of cell division found in plants and animals. 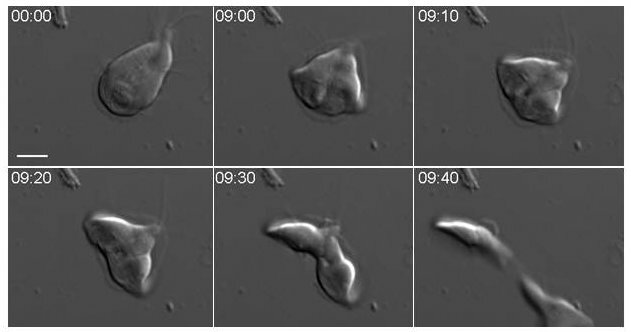 Time lapse images of mitosis and cytokinesis. New therapeutics are needed for infections caused by the intestinal parasite Giardia, as up to 20% of cases are resistant to the frontline treatment metronidazole. Few molecular targets in Giardia have been examined, let alone rigorously validated, as possible targets for new drugs. We have identified a set of protein kinases in the Giardia genome that share an unusual structure feature in their active site. This feature, an atypically small gatekeeper residue, confers sensitivity to a class of compounds called "bumped" kinase inhibitors (BKI) that do not inhibit mammalian kinases. BKI's in general, show good pharmacological properties and have shown minimal toxicity in mice when administered in the course of other work. We have demonstrated that even incomplete knockdown of these small-gatekeeper kinases significantly impairs Giardia growth. We have also shown that BKI's can suppress Giardia growth. The ultimate goal is to identify lead compounds for evaluation as potential drugs against giardiasis. This is a collaborative project also involving Ethan Merritt (UW Biochemistry), Dustin Maly (UW Chemistry), and K.K. Ojo (UW Center for Emerging and Re-emerging Infectious Diseases (CERID)).